The Most Beneficial Form Of Vitamin D! 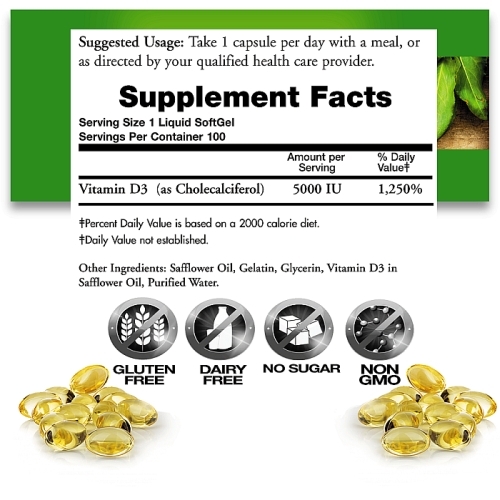 In humans, the most important compounds in this group are vitamin D3 (also known as cholecalciferol) Essential D3 softgels supply this key vitamin in a highly-absorbable liquid softgel form. As more people avoid sun exposure, Vitamin D3 supplementation becomes even more necessary. Daily intake of Vitamin D3 is essential for calcium absorption and maintaining strong bones and teeth. Contains no:sugar, salt, starch, yeast, wheat, gluten, corn, milk, egg, shellfish, artificial color or flavor. ORDER Your Vitamin D3 5000 IU Liquid Soft Gels Today!